They do the "hands" drill every day, work on pick and roll defence (the most important thing in the NBA), and not fouling. You are what you emphasize. All defenders shift towards coach when he has the ball. 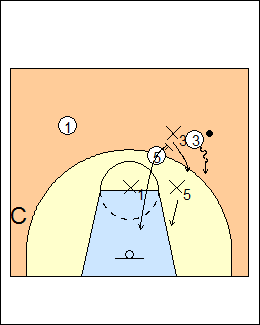 Coach passes to 1, X1 closes out with a "high-school" close-out (they want to emphasize the basics), chops his feet, high hands, gets touch distance from 1, up into him, touches 1 on the (inside) hip then shows his hands. Take a jab step with the back foot, then get right back up. 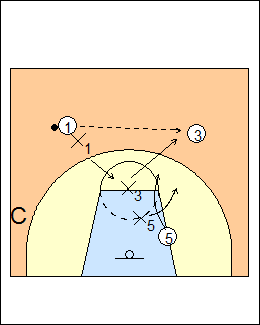 1 swings the ball to 3, X1 shifts to the nail, X3 makes a high-school closeout, 5 goes to set a pick and roll, X5 has to be loud, up, long and active (LULA), he yells "down, down, down". 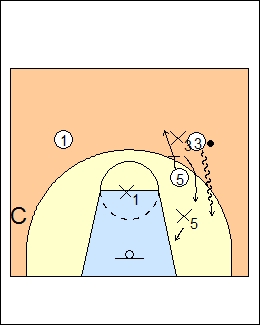 X3 forces the pick and roll down, he is LOLA (lock, over, long, active), physical, up on 3's hip. X5 is touch distance from 5, he concedes ground as 3 comes off the screen. 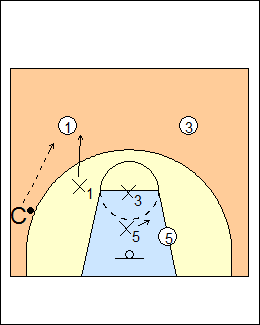 X3 and X5 are responsible for the ball, X5 has to stop the ball, he can't leave. X3 and X5 are eating space, very active with their hands. X1 stunts at roll-man 5, creating indecision for 3. 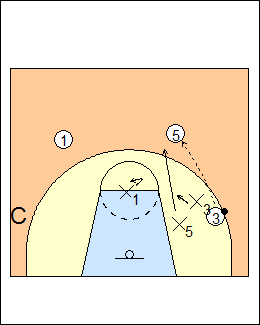 They don't want X1 to be too engaged (in a game, a low weakside defender will take the roller). Matt Woodley - X5's drop coverage is one marker above the high-school block, he matches 3's number as he comes off. If 3 is able to use the screen and go middle, X3 spins under the screen to pursue (never fight over the top). It's live. As 3 skips it to 1, X3 and X5 have their hands up, a hang-time pass. X1 has to close out, this is the most important close-out in the NBA game. He can't get sucked in too much or his close-out is too long. Woodley - when they close out they don't do any of the chopping stuff. Treat everyone like a shooter, sprint to your stance. The minute you break down your stance and put your hands up, he can go anyway he wants. 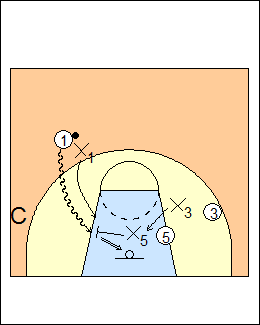 We're sprinting to take away the 3 and push him to the corner. X1 is touch distance, that's good physicality on the ball, but as soon as 1 drives that's a hand check, and that's a foul. X1 shows his hands, palms up and facing out, chest out, it doesn't allow him to reach in and foul. X5 comes across and goes verticality, as long as his hands are up, he can jump straight in the air and it's not a foul. They really emphasize defending without fouling, showing your hands, and using your length. X3 has a natural tendency to relax after 3 passes, he has to stay engaged, defend multiple actions. He has to keep 5 off the glass, that's a hard job, get into his legs, get low for leverage, that's his only advantage, 5 can't jump as well. 1 throws up a shot, finish with a rebound. 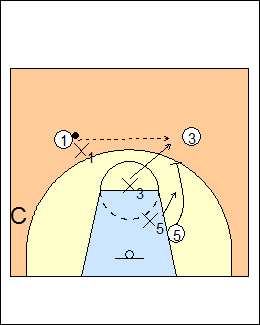 1 passes to 3, 5 ballscreens (here a step-up screen). Woodley - treat this like a middle pick and roll, go under 3 out of 4 times. 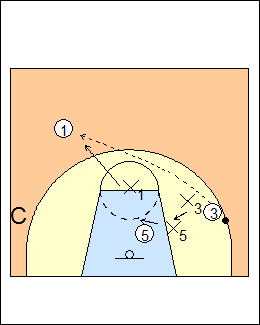 If X3 gets hit by the screen he spins under, to the middle, and pursues to get back in the play. 3 throws it back to 5, X1 stunts at 5, X5 closes out (a high-school close-out). 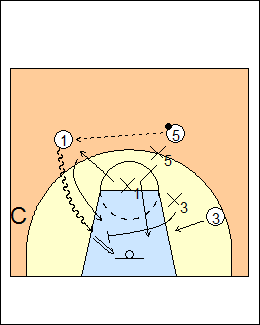 5 throws it 1 who drives, now X3 has weakside bottom and X5 has weakside boards.